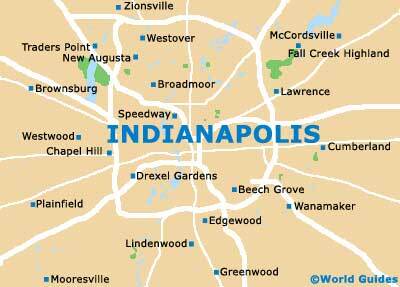 Indianapolis is a city with no shortage of history and heritage, and this is particularly evident in its landmarks, memorials, monuments and impressive buildings. It is not so much the number of landmarks on offer in Indianapolis, but the sheer grandeur of them that makes downtown Indianapolis a must-visit destination for anyone with an interest in the city's past. The Admiral Raymond Spruance Memorial Basin is a geographical feature of the town dedicated to the US Navy officer Admiral Raymond Spruance who is noted for his military expertise in the fight against the Japanese during WWII. 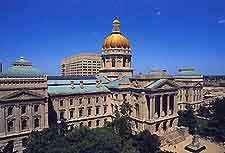 The Indiana State House, often referred to as the Indiana State Capitol building, was finally completed in 1888 after many years of construction. Featuring an enormous golden dome and classical Greek-revival style architecture, the Indiana State House has become one of the most instantly recognizable landmarks in Indianapolis and was once the second-tallest structure in the state. Measuring 255 feet / 78 meters, highlights at the Indiana State House include regular guided tours, which last up to 90 minutes. 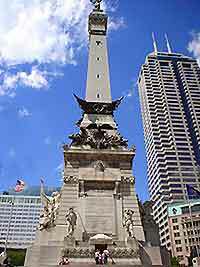 The Indianapolis Soldiers and Sailors Monument is a 284-foot / 87-meter limestone construction created in honor of the soldiers who lost their lives during the Civil and Spanish-American wars. 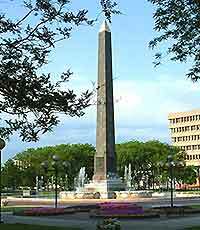 Erected in 1902, the piece is hailed as being among the world's most exceptional monuments. Located just east of Indianapolis, Huddleston Farmhouse is an aging property that captures the essence of rural and pioneer life from the days of America's westward migration and settlement. Visitors can receive guided tours of the facility and learn all about the life and times of a true Hoosier family. 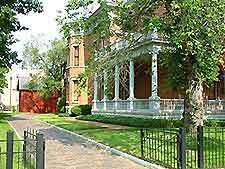 The President Benjamin Harrison Home in Indianapolis is the former residence of the 23rd president of the US. This impressive building is open to visitors who can view much of both the exterior and interior's original design. There is also a range of well-preserved artifacts, including clothes and political mementos at the President Benjamin Harrison Home. 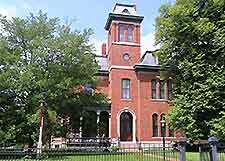 The Morris-Butler House is a three-floor 1862 Victorian mansion now serving as a popular visitor center. This important Indianapolis building is home to a range of decorative art pieces including sculptures, paintings, tapestries and lithographs, as well as some fine furniture and silverware. Tours of the facility are available and reveal aspect of family life in the Victorian era. Open hours: February to December, Thursday to Saturday - 10:00 to 15:00. Guided tours available on the hour.